Make a colorful tent for your kids to relax under this summer with Krylon®! Before beginning the project, set up in a well ventilated area on a hard, flat surface. Make sure all your wood is sanded down and is smooth. To make the frame of the tent, take four wood boards and measure 20 ½" down from the top of each board and make a mark in the middle of the 1 ½" wide face of the board. Drill a ⅜" hole at each mark. Put two of the boards to the side, and place the other two boards on their vertical ¾" edge so that they are parallel from one another and about six feet apart. Make sure the holes that you drilled are at the top of each board. With a new board make a cross brace, and lay it with the 1 ½" edge face up horizontally across the two vertical boards previously laid out so that it is flush with the bottom end of each board. Drill a ⅜" hole in each end of the horizontal board and then screw each end into the vertical ¾" edge of the parallel boards. From the top of what will be the bottom cross brace that you just drilled, measure 23" up and repeat the above process to create a middle brace, using another board. For the top cross brace, you'll measure another 23" up from the middle cross brace and repeat again. Now you should have two parallel vertical boards with three attached cross braces. With the other two boards that have the holes drilled 20 ½" down from the top, repeat the steps above to create the other side of the tent. To join the two frames, stand them up vertically, with the holes drilled at the top overlapping each other. Place one of your washers on a ⅜"x2" hex bolt and slide the bolt through the drilled holes, and hold it in place with another washer and wing nut. Repeat on the other side. Spread the two sides about 3 feet apart to create the "A", and tighten the wing nuts even more, if needed, to secure them. Prior to spray painting, read the can label for safety and application instructions. Using Krylon® Fusion All-In-One™ in Gloss White, apply roughly 4 thin coats of paint to the entire tent frame. After the frame is completely dry, drape the washed canvas drop cloth over the frame. To attach the drop cloth to the frame, pull it taught underneath the bottom cross braces and staple them on the inner side of the tent. Use about eight or nine staples along each side to ensure that the drop cloth is securely attached. Use blue painter's tape to tape off triangle shapes at the top of the tent. Follow the top triangles with alternating triangles below. Also attach two pieces of tape across the entire canvas to make the two stripes. Use a plastic drop cloth to cover the areas you want to remain 'paint-free' including the white frame of the tent. Secure with more painter's tape. For the triangle design pattern and one of the stripes, spray on Krylon® COLORmaxx™ in Satin Sea Glass. 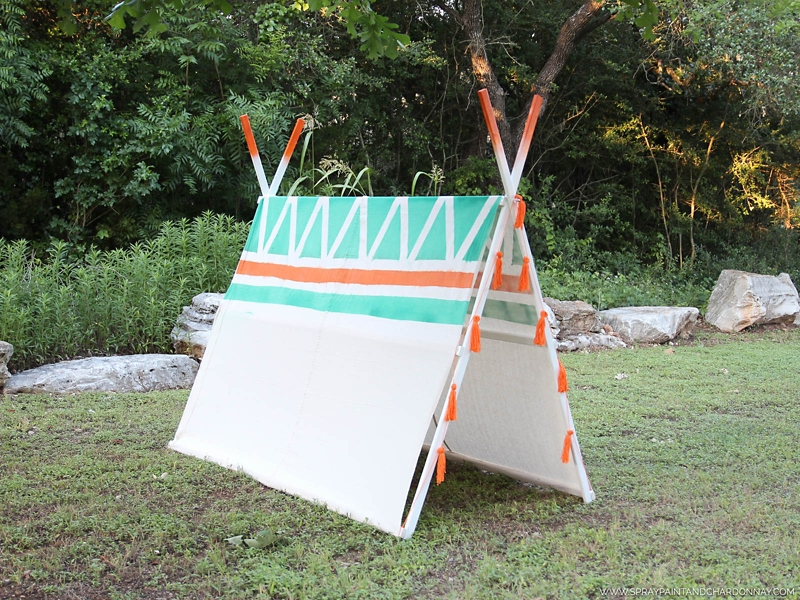 To add extra detail and another pop of color use Krylon® COLORmaxx™ in Gloss Pumpkin Orange for one of the stripes and on the tips of the wooden frame of the tent (an ombré effect is shown in the accompanying image). Top the tent off with some yarn-tassel fringe, and secure it with pins to the canvas so that it can easily be removed if needed.